After a slow start to the morning and a late breakfast, I began to work on lunch. I decided to make Ground Beef Vegetable Soup. I cooked the ground beef, cut up the vegetables, got it all simmering together and then EJ, Danny, and I went for our morning walk. It was a beautiful morning, although rather hot, and EJ and I enjoyed the hundreds of butterflies flittering in the field. 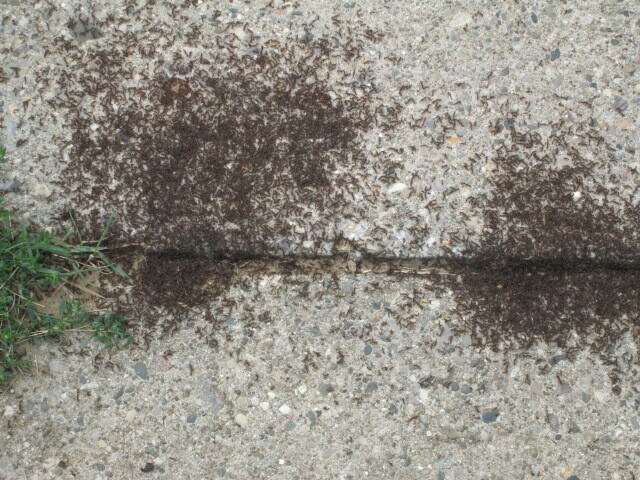 When we passed the west side of the field, we paused to watch thousands of ants swarming around a crack in the sidewalk. We speculated on reasons why ants swarm–EJ’s answers were less serious than mine. But I later googled it and discovered that when a colony gets too big or cannot be supported by the environment, it splits off with a new queen to form an entirely new colony elsewhere. When we neared home, EJ and I separated–he going to the bank because today was payday, and me taking Danny home. Usually we go to the bank together but I wanted to check on the soup and wash the dishes. When EJ returned home, he went outside with me while I dumped the bucket of vegetable peels on the compost pile. He checked his garden and brought in a cabbage and some peas, bell peppers, and tomatoes. EJ had just enough time to eat a bowl of soup before he had to leave for work. The soup was delicious and we have enough for tomorrow. After EJ left, I washed the lunch dishes, started a load of laundry, and then spent about one and a half hours studying Hebrew with my friend. Have I told you how much I love studying Hebrew? Here is a random thought: Sometimes I like to watch people in places like grocery stores and wonder about their lives. I think that the life of everyone is a story. Strangers are like unread books. A person we see might be suffering terrible things–like abuse or a loved one with cancer. Another might have an exciting life–he (or she) might be a world traveler or go bungee jumping off bridges. That man or woman might have an incredible talent–like be a famous musician or dancer, painter, or writer. Or that average-looking woman might be studying Hebrew or writing a blog. Sometimes I think that that ancient little old man in a wheelchair that no one gives a second look at could have been a hero in a War–he could have been an airplane pilot, a member of the Resistance, a soldier with a purple heart. Who knows? Before I met EJ and before JJ existed, when I was working as a word processor at a consulting firm, an elderly man drop off some work for my boss. After he left she said “That man is a Holocaust survivor. He has a number tattooed on his arm.” I was awed. What terrible things that man has seen and suffered and survived. So…many times I do not look at people as if they are simply average uninteresting people. I wonder what their stories are. Ok, now back to nonrandom thoughts. After I finished my Hebrew study, I put yesterday’s herbs –now dried–in jars, rinsed and sorted out the withered leaves of more herbs that I picked from my garden earlier today, and set them to drying. I am drying parsley, a little bit more sage, and some fennel. I’ve never dried fennel before so it will be interesting to see how it goes. I picked a little bit of thyme, but my thyme didn’t grow very well this year. My sweet friend, Simone, who lives in another country, commented that she had never seen a food dehydrator. Her comment stirred my thoughts so I decided that I would write about drying foods. A round dehydrator. This is similar to what I use. Hanging herbs to dry them. Herbs, veggies, fruit, and even meat can be dried. I mostly dry herbs–mainly because I haven’t had much success in drying other things like bananas. I'[ve never tried to dry meat. I use fresh herbs from my garden in the summer and towards the end of summer I start drying them for winter use. Usually I dry oregano, basil, sage, thyme, rosemary, parsley, hot peppers, and sometimes spearmint or peppermint. I am still learning how to grow, use, and dry different herbs. Sometimes I plant herbs in my garden that I don’t know how to use, but then I learn about them. 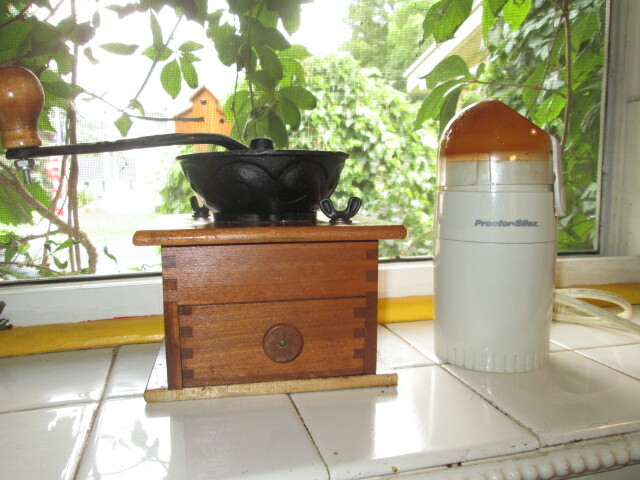 My old-fashioned coffee grinder and new-fangled “spice” grinder. Another thing I like to do is buy cinnamon sticks, cloves, or ginger root from the farm market-type store and then grind them myself in a small electric coffee grinder that we bought for a couple of dollars at a yard sale. The electric coffee grinder does very well at grinding the spices into powder. Sometimes we buy coffee beans instead of ground coffee and, since I’m using the electric coffee grinder for spices, I use an old-fashioned coffee grinder for the coffee beans. 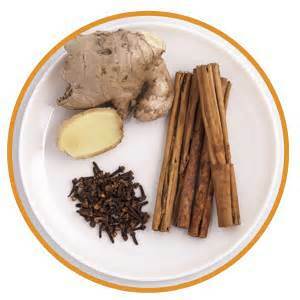 Cinnamon and cloves do not grow in our area. Last winter I put a ginger root that was sprouting in a pot to see if I could grow it myself. It actually began to grow, but it died from neglect in the busyness of caring for JJ as he fought cancer. Maybe I should try it again this winter? I can dry the cinnamon and cloves immediately, but I have to dry the ginger root in the dehydrator before I grind it. Grinding spices myself is cheaper than buying them in tiny amounts at the store and it’s no doubt healthier. I think it’s rather fun. The rest of my day will be spent finishing the laundry and occasionally checking the herbs to see if they have dried sufficiently. I have been quite busy this week. Today has been quite warm and humid (and stormy) but, even so, there is the feeling of autumn in the air so I felt more energized. WOW boy did I learn a lot this morning. And I’m going to see if it is a good idea to have much more herbs next year on my balcony and dry them. I have peppermint and lemon balm at the moment which is doing great. So I thank you Teri for giving me this lesson I’m going to find out what I can find in Holland about this…..
Keep me updated on your herb-growing and drying adventures, Simone! Oh….and have you made the Zucchini pie yet? I’d love to hear what you think of it. You keep my mind open TJ, I think I’ll get my dehydrator from the basement, out of sight out of mind and I do have the means to gather some of my herbs from the garden before I loose them to winter. Quite foggy this morning, I was hoping for a nice rain during the night but I will have to water the gardens, so much better when the Lord does it for us. Have a wonderful day and enjoy!! I find “out of sight, out of mind” is very easy for me too! We are expecting rain this afternoon so maybe G-d will water your garden after all! I wish you well in your herbing! Very interesting information. I have grown herbs myself and usually just crush them in a plastic bag, but the idea of purchasing whole items and grinding them sounds like a plan. Do you freeze your herbs, Lucindalines? I have heard that some people do. I freeze bell peppers, but like to dry the hot peppers. Wow, never thought of freezing herbs. I have a dehydrator like the first picture you showed, and I do use that quite a bit. I have only started growing herbs in the past two years. It is more Paulina who likes to cook with more spices. I was raised on salt and pepper. She watches all sorts of cooking shows, so has more of an idea. Thanks for all of the information. I didn’t really know how to use herbs either (other than salt and pepper) until I started growing my own. There is still many that I don’t quite know what to do with, but I try to learn. I prefer dried herbs because I am more familiar with them….and my freezer is full enough without herbs.